The new series of standards for the construction of switch and control systems, DIN EN 61439, will take effect on 1 November 2014, superseding the previous standard DIN EN 60439 with a transition period. Affected are all switch and control systems for the operation of machines and systems, as well as power distributors for high current applications. The reason for the new legislation is to improve the reliability and safety of such systems. The required documentation for planners will increase significantly as a result of the new standard. In the future, detailed type and item certifications as well as thermal calculations will be required for all switch and control systems. Bürkert fulfils new standard for switch and control systems. 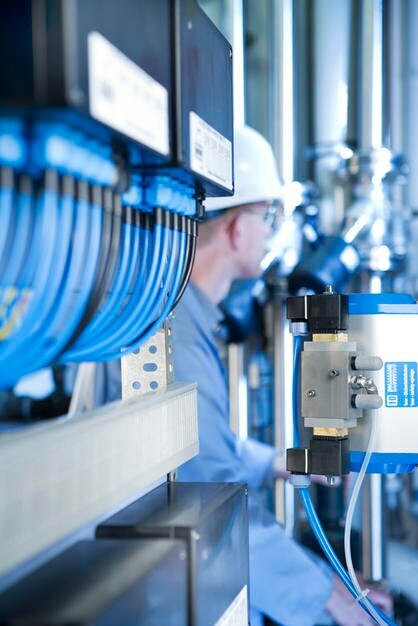 The fluid technology specialist Bürkert is already capable today of providing its customers with control cabinet solutions that comply with the new legislation. “We fulfil 100% of the changes introduced in the new standards. All of our products in this area are available in conformity with the DIN EN 61439 series of standards,” reports Jens Fuhrmann, Manager of the Dortmund Systemhaus. Bürkert experts at this location in Germany’s Sauerland region bear the entire planning, engineering, manufacturing and documentation responsibility for custom control units. This also includes delivery and commissioning of end-to-end solutions for every process environment, including potentially explosive areas. The strength of the Menden-based centre is in the many years of experience in the systematic combination of fluid technology with electrical and electronic systems. Bürkert currently has 64 employees at the Menden location, divided between Sales and Systemhaus. The number of employees is growing steadily and there is a continuous demand for additional qualified personnel.